Lucky Witch is a 5-reeled slot machine that invites players to go into the world of magic and witchcraft through the environment that the game creates. Players will get to accompany the Lucky Witch as she guides them into that world so they can get to claim the riches and the fortunes that it offers. Microgaming creates that world through the amazing visuals and the magic themed soundtrack that runs in the background. 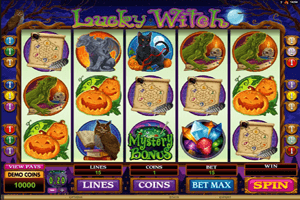 Play Lucky Witch Slot here. The symbols include a black cat, the beautiful lucky witch, potions, pumpkin, a gargoyle, magical shards and diamonds, a mysterious spell, a cauldron and more. These symbols appear on the 15 lines of the game and the 5 reels it offers. Bets can be placed on those reels at the bottom of the reels. Players can choose the number of lines, the coin value and the amount of coins they want to place. The game has 2 wild symbols, the logo of the game which will substitute for other 4 symbols, there is also the lucky witch symbol which will only substitute for other symbols during the free spins round. Speaking of which, the free spins round is activated when players get 3 magical potions on the reels of the game, they will earn 13 free spins. The last special symbol is the cauldron which can trigger the Mystery Bonus round.